There are times when it is beneficial, or even mandatory, to spell numbers out. For instance, you may want to spell out “1234” as “one thousand two hundred thirty four.” The following macro, NumberToWords, does just that. It is rather long, but it has to do a lot of checking to put together the proper string. There are actually five macros in the set; the four besides NumberToWords are called by NumberToWords to do the actual conversion. NumberToWords will convert any number between 0 and 999,999. To use it, simply select the cell (or cells) whose contents you want to convert, then run it. You should note that the cells must contain whole number values, not formulas that result in whole number values. The actual contents of the compliant cells are changed from the original number to a text representation of that number. In other words, this is not a format change, but a value change for those cells. 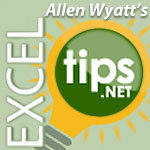 Excel Tips excel.tips.net, Microsoft Excel. permalink.